Above: Some footage of the FLEX 2 experiments, part of a series of experiments to better understand fire in space. Oddly beautiful, isn't it? To understate things hugely: Being stuck in a burning building is not fun. That’s why we have a heroic body of people called the fire service who do the ‘save you from a burning building’ thing. In a space there’s no fire brigade, and outside is only slightly less deadly than the fire - which means an astronaut crew has nowhere to run, and no-one to help them in a major fire. And it's not like they never happen: In 1994, on the Russian Mir space station, a cosmonaut thought he’d beaten a small fire out with a jumpsuit (I assume a spare, unless naked firefighting in space is the best way to do it). Moments later he was horrified to find the the fire had just jumped into the jumpsuit, and was cheerily burning its way back out through it. "As the fire spewed with angry intensity, sparks – resembling an entire box of sparklers ignited simultaneously – extended a foot or so beyond the flame’s furthest edge. Beyond the sparks, I saw what appeared to be melting wax splattering on the bulkhead opposite the blaze. But it was not melting max. It was molten metal. The fire was so hot that it was melting metal." 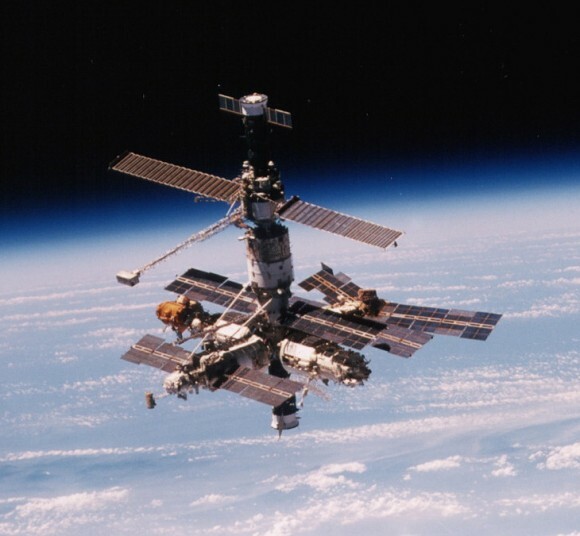 Above: The Mir space station. One day someone will made a movie about it. That movie will include fires, the station getting rammed by a space freighter, and lots of cross-lingual swearing. Fire is generally hard to fight in space, partly because it can become freaking invisible: On Earth hot air rises, pulling the waste products and the flame itself into a relatively well confined (and hence easy to spot) cone. In space the flame has no such guide, so it spreads in a diffuse fashion that spreads out the light it emits – so much that it becomes almost undetectable. For the same reasons, fire is also less predictable in space: On Earth it will tend to spread upward faster than it does any other direction, but in space it spreads in all directions. 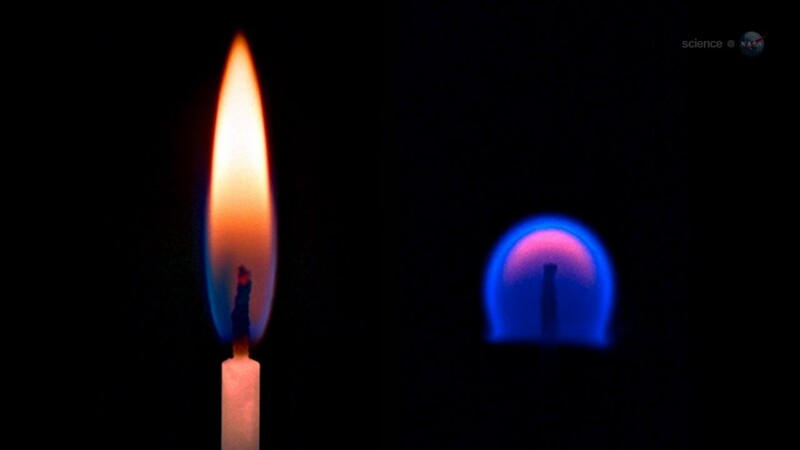 Above: On the left is a normal flame, and on the left is a flame in space. Courtesy of the Discovery channel. Oh but it gets worse: In space a fire will change how it operates to fit its circumstances, reacting to its environment. Fire wit limited oxygen in space will, rather than simply going out, split itself into many tiny ‘flamelets’. The flamelets use much less oxygen than a single flame front, move quickly and independently, will each then go it’s own way until one finds a new source of fuel and oxygen, and will cover more ground by dividing and multiplying where they can. The effect has been reproduced on Earth by keeping a fire sandwiched between glass and metal sheets, suggesting that the effect is linked to the different way air moves under microgravity. To make the job of a space firefighter even harder, fire in space also needs less oxygen, and can stay burning at a lower temperature, making it much less likely to burn itself out. In experiments, fires have even been seen to carry on burning in an 'impossible' fashion: Still combusting after they’ve been apparently extinguished, via some unknown mechanism. So how do you put a space fire out for good? “We have procedures that deal with each case depending on the severity of the situation. In the most serious cases, we would don breathing apparatus and fight the fire using either CO2, water mist or foam fire extinguishers. We would also try and locate the power source and remove electrical power (electricity is most likely to be the cause of a fire on board). The smoke detectors trigger an automatic response from the ISS to shut down all ventilation systems, so as not to feed oxygen to the fire and to reduce the spread of smoke throughout the station." If all else fails, the ISS always has at least one man rated spacecraft docked to act as a life raft. However the crew operate on a very, very strict ‘prevention is better than cure’ policy*: Anything going up to the ISS is tested to make sure it's completely non flammable - that's done by pressing a heated filament against it in a ventilated, sealed, box. When an experiment or mission absolutely must carry something flammable up there the crew do everything humanly possible to keep it away from any sources of ignition. * Because you don't want to tell your boss you broke the ISS and left it to explode now, do you? Unless you're Sandra Bullock. How many moons does Earth have now?